For quite a while I have been inspired by the zeal of the comrades of the Pencil Revolution. 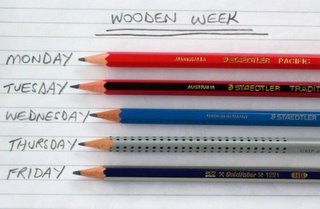 Now whilst my main interest is mechanical pencils, I am certainly not immune to the charms of wooden pencils, so I thought that it was time to put my mechanicals away and have a “wooden week”. Anyone visiting a selection of shops here in New Zealand would quickly get the impression that Staedtler was the market giant, with Faber-Castell a fairly distant second, and so I decided to trial three Staedtlers and two Faber-Castells. I chose the following HB grade pencils as a reasonable selection of different price ranges, qualities and designs. Rather than a lengthy or formal review of these pencils I am just going to concentrate on some general points and a few selected issues. First is, I had forgotten just how loud wooden pencils are! Writing with them is really noisy compared to mechanical pencils. Amazing. The next thing is how important your choice of sharpener is to the whole situation. I used a KUM (Germany) metal wedge (no other ID markings) and a Dahle 53443 sharpener, also from Germany. The really big difference between these two sharpeners was the “bite”, i.e. the thickness of the layer they peeled off the pencil. The KUM was taking a much thicker layer off the pencils and left a rougher finish on the wood with more flaking or fracturing of the lead. The Dahle left a smoother wood point and lead. Another thing common to all the pencils was how much thinner they are than mechanical pencils and because of that I didn’t initially find them as easy to grip as mechanicals in general. The three Staedtler pencils are a progression of price and quality levels. Staedtler advertise the Pacific as “economy, general purpose”, Tradition as “high quality” and Mars Lumograph as “premium quality”. In practice it’s easy to see why. The Pacific has a one-colour paint job, with the end simply sawn off square and unpainted. The lead is definitely the softest of all the pencils and I had to sharpen this more frequently than the others. It’s lead was also the scratchiest and noisiest. The Tradition has a two-colour paint job, and it’s three colours for the Mars Lumograph. The actual paint quality on the Lumograph is also clearly superior to the other two as you can still see some wood graining under the paint of the Pacific and Tradition, but not on the Lumograph. That’s all nice appearance stuff, but I didn’t really notice a huge difference in the hardness and blackness of the leads, except for the Pacific. Faber-Castell are a little less forthcoming on categorising the quality levels of their pencils. The paint job on the Grip is a single colour and you can see wood grain under it. The Goldfaber is a two-colour of similar quality to the Staedtler Mars Lumograpgh. I felt the lead on the Grip was possibly a little harder and not quite as black as the Goldfaber, but I guess this could also just be my opinion, routine manufacturing production batch differences and so on. Overall the quality of the actual wood and leads on all these pencils seemed pretty good to me, as you would expect from these long established reputable companies. The paint finish on the Lumograph and Goldfaber produced a much better grip than on the Tradition and Pacific. The Grip 2001 was actually a bit of a disappointment to me. The comrades of the Pencil Revolution generally rate it pretty highly, and its mechanical cousin the Grip 2011 certainly impressed me. Perhaps this all built up an unrealistic expectation, but the Grip 2001 was the only pencil I was actually disappointed with. Its triangular cross section made it the thinnest of the pencils, the “grip dots” were very uneven in size and didn’t really seem to make up for the reduced ease of holding caused by the thin cross-section. Sharpening was also a little erratic which I put down to the triangular cross-section. Personally I would rate the paint finish and larger cross section on the Mars Lumograph and Goldfaber as combining to produce a better grip than the Grip 2001. So that’s the end of my “wooden week” - a nice change and it was good to try out a few different pencils. Great post! I think the Faber-Castell Goldfarbers are made in Malaysia, with some of their erasers, etc. Another great one is the Castell 9000, if you can find them in New Zealand -- getting harder to find them in the US sometimes. Glad I came upon ur blog. Like it a lot. I'm looking to do a hobby of tryin gto make my own pens. Anyway, I'm thinking about doing a pen w/ a pencil and pen. Twist onw way and the pen comes down.. the pencil comes down. Any instructions or drawings to get me started. Kaweco (Germany) makes an interesting "limited edition" combination fountain pen and pencil, the "Combimatic." The pencil is on one end, the pen on the other, and you can separate the two by unscrewing them. You can see a photo at www.swisherpens.com. Check out the price: $350. Yow. I guess that WOULD be a limited edition. Thanks for reading my blog. Sorry I have been a little slow replying to you. By strange coincidence my uncle just made a pen for me, you can read about it here shortly. Having said that, I’m not sure I can help you much – I’ve never made a pencil myself. I assume you are going to make just the body of the pen and use a mechanism from an existing pen? That’s what my uncle did. I don’t have many multi-pens but their mechanisms look interesting. If I was going to make a multi-pen I think I would be trying to get a mechanism and then make a body to take it. Personally I like the Lamy multi-pens (which you can see on Lamy.com) and you know they’re good quality, so I’d be trying to get them out of their Lamy body. But they’re not cheap so I’d be practicing on something cheap! Sorry I can’t be of much help. I would be interested to hear about your finished item! Good luck. Is it really true that wood-cased pencils are noisier than mech pencils? I tried some experiments with the ones I have, and I really couldn't tell the difference. I thought maybe my hearing wasn't up to par, but then I tried some ballpoint pens, and they were definitely quieter. Maybe it's the fact that my mech pencils are all .7mm. The thinner leads are perhaps quieter...? Hey thanks for leaving a comment. I can only say the that the ones I used are really noisey, but I am going to do a bit more experimenting and investigating, so please check back in a week or two for more comments or perhaps a whole new posting "Noisey Leads"? I do think wooden pencils tend to be louder than mechanicals, although I can't really imagine why as it would depend on the lead. My hearing is pretty bad. Thanks for the post. And your site is great! As for the Grip 2001, I really like how thin it is but I have very small hands. Big thick pencils and pens -- esp. fountain pens and mechanicals -- seem like writing with those Biggie Crayons for me. kiwi-d - My first time commenting on your site. I've checked it out on occassion despite my devotion to wood cased pencils. Glad you took a weeks walk in the woods. Hope you'll visit more often and try our California Republic Palomino too. Loudness of pencils will be a function of the lead characteristics and the pressure applied while writing. Since wood cased pencil leads are generally using a lead diameter of about 2.0mm and most mechanicals are 0.5mm or 0.7mm you tend to have a bit more strength in the lead for wood cased pencils. This allows greater pressure to be applied without breaking leads and a wider range of darkness shades that can result from different pressure levels. Also the grittyness vs. smoothness of the lead will make a difference in how much it scratches versus glides across the paper. Waxed leads will be smoother than unwaxed. Of course the sound of the pencil is also part of it's charm. PRevo - Faber does not make wood cased pencils in Malaysia but erasers and some other products. These pencils most likely came from their plant in Indonesia. Thanks for all the comments. Always glad to hear from anyone who reads my stuff! My little investigation into the noise of leads is basically complete so I've just got to write a new post. So with luck "Noisy Leads" should appear next week. Woodchuck is right about the Goldfaber 1221, it is made in Indonesia. I have recently seen some artists sketch packs of a mixed dozen Goldfabers and it says "Made in Indonesia" on the pack. I'm surprised that you said that the Goldfaber was of comparable quality to the Mars Lumograph. When I first discovered the Goldfaber, I was happy because it cost less than half of the lumograph. However, upon comparing their output, I can say that buying the more expensive Lumographs is worth it. Solid shading with a lumograph (whatever grade) is smoother and much less shiny (especially for the softer grades), and almost charcoal-like for the 8B. All the goldfabers (I tried up to 8B) leave shiny marks similar to that of a regular number2 pencil. Hello Ryan. Thanks for your comment. Actually my comments about Goldfaber and Lumograph were really more about their paint finish and wood quality, etc rather than their leads. I didn't really review any of these pencils fully, just used one a day for general writing. I certainly won't disagree with your comments as I just used each pencil for general writing - I didn't do any comparisons or evaluations for sketching for artistic purposes. Also I only used HB, didn't look at any other grades, etc. The best straight comparison based on quality is between Lumograph and Faber Castell 9000 - both great pencils. Me, I like the Lumograph in B for the first minute and then the FC9000 B thereafter - the FC point lasts much longer and reaches a sharpness stage after a few minutes use which is a heavenly experience. By the way on a sharpening note: with FC9000 pencils (or any other standard wooden pencils) - pare away with a good sharp knife until you have reached a long conical shape preferred by artists then finish off using the small cheap 2mm clutch sharpener sold in art shops (Staedtler, Faber Castell both produce these cheap sharpeners) - you can only sharpen up to 2B this way because beyond 2B the lead is too thick for the 2mm clutch sharpener. This method produces a point on a wooden pencil as sharp as a needle and is far better than the KUM Automatic Longpoint sharpener which tends to tear the wood near the join with the lead. This sharpening method is of course best for fine detailed work. By the way I use FC 9000 pencils and my preferred small cheap 2mm clutch sharpener is the green Faber Castell one - I find the Staedtler one dosen't work quite so well. Another thing I didn't mention is that in the paring operation you should expose about 15mm of the lead - this gives a lovely long point and is easier to finish off in the clutch sharpener. WARNING - if you sharpen v/hard leads this way (H to 7H etc) you will blunt the small sharpener in about three sharpenings so its best to stick to Hb, B and 2B or set aside one sharpener for your harder pencils and one for your softer pencils. They are cheap and I have a lifetimes supply of these little sharpeners.